Gordon’s Fireplace Shop, 3300 NE Broadway. Home of a former aircraft manufacturing plant owned by Oregon Home Builder’s President Oliver K. Jeffrey. One of Alameda’s most prolific home building companies—The Oregon Home Builders, Inc.—is also responsible for building an aircraft manufacturing facility in the neighborhood that endures to this day. There is much to be written about Oregon Home Builders, Inc.—and we’ve been on their trail for several years now—but suffice to say its owners had a big vision. They founded the company on a business model that involved selling shares of stock at .25 cents each to investors at large, and building and selling homes. They also built some of Alameda’s prized national register houses, including the Oliver K. Jeffrey House at Regents and Shaver, and the Thomas Prince House at Alameda and Regents. Others, including the George Eastman House on Stuart Avenue—designed and built by Oregon Home Builders—should be on the register. 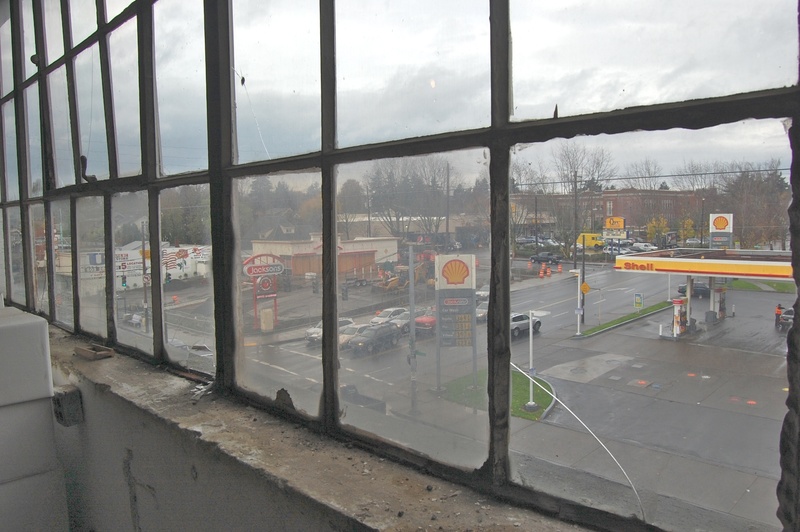 In 1914, the company built 45 houses here in northeast Portland, and drew plans for many more. As a base of operations for this big vision, Oliver K. Jeffrey and his colleagues needed a workshop and warehouse near the market they were serving, and near transportation. So in 1915 they set out to build a warehouse on the Oregon Railway and Navigation Line in Sullivan’s Gulch, today’s Banfield corridor. 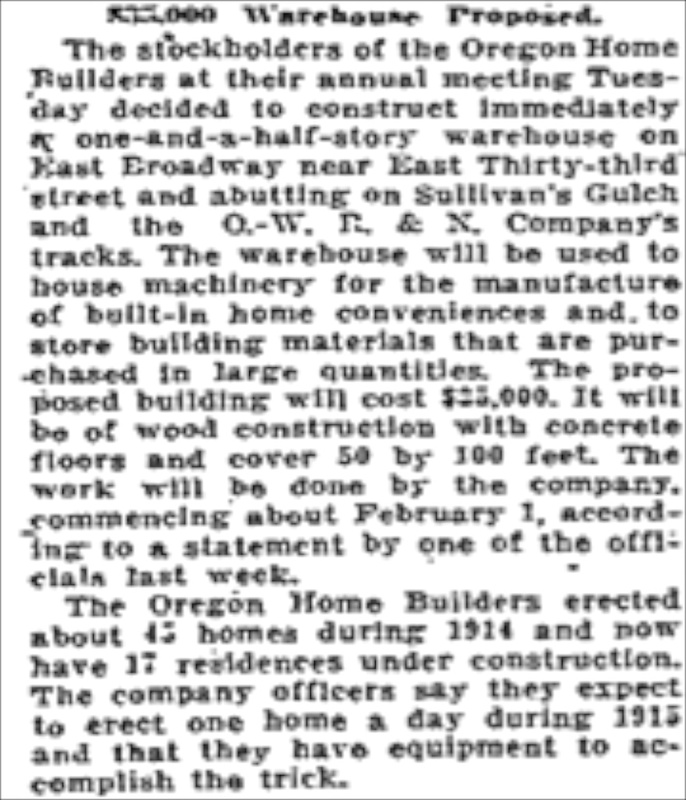 Here’s a snippet that’s a tad fuzzy but readable from the January 17, 1915 pages of The Oregonian. From The Oregonian, January 17, 1915. But by 1917, O.K. Jeffrey’s passions—and the Oregon Home Builders warehouse—were focusing more on airplanes. A flamboyant character in Portland business and social life, and a man of means, Jeffrey received much coverage in the pages of The Oregonian during these years, whether in his role as a top Rosarian, his very public divorce proceedings, or his role as a brave tank commander during World War I. The story below in the August 1, 1917 edition focuses on the airplane factory building at 33rd and Broadway. Click to read full size. From The Oregonian, August 1, 1917. The O.K. Jeffrey story takes several more interesting turns, including bankruptcy for Oregon Home Builders by 1918, further innovations in aircraft design and operation, and his untimely death due to blood poisoning from a freak accident in December 1934. Much more to come about Mr. Jeffrey, his company, and the homes they built, but back to the airplane factory in our midst. The folks at Gordon’s are helpful, and interested in the history of their building (which they’ve been in since 1990), but their collective memory of the building can’t see back around the corner of time. They do have a story here and there about a pasta manufacturing company that once inhabited the building. Some sense of the retail furniture company that operated there for 30 years. 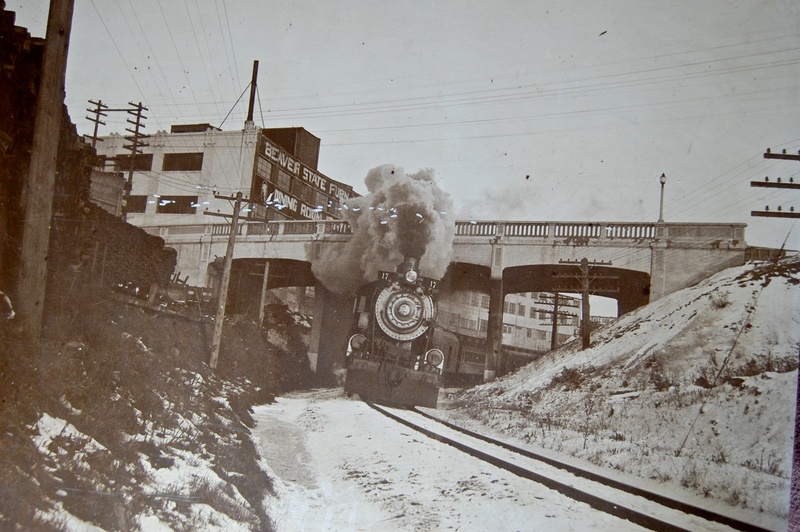 And a fabulous picture from 1929 that was first and foremost a portrait of Union Pacific Engine 17 coming around a bend in the track, but secondarily a picture of the building. See the distinctive brick pattern along the parapet? Look also how the building extends quite a ways east around the bend of the gulch. Looking east in Sullivan’s Gulch on January 20, 1929 at Union Pacific Engine 17. 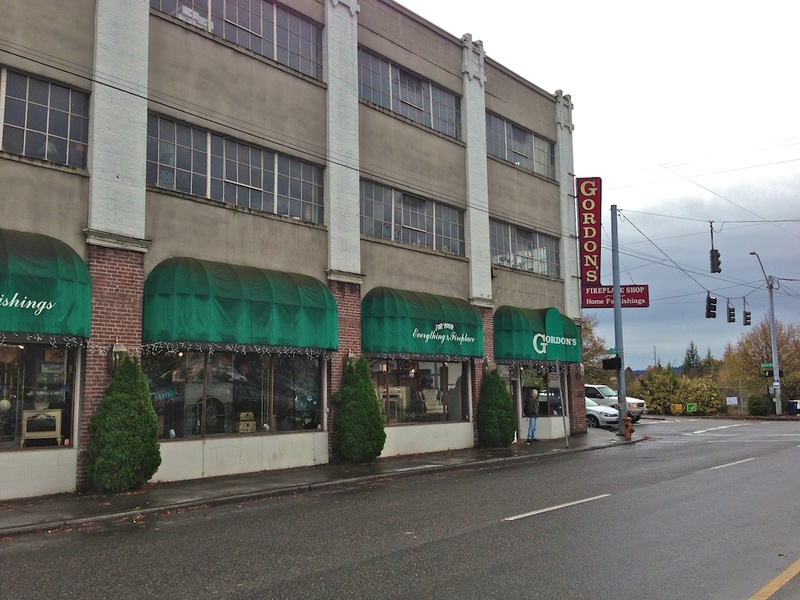 The “Beaver State Furniture” building is no longer an aircraft parts factory. The building wraps around the rim of the gulch. Note also how much narrower the gulch is…widened in the 1950s to make room for the Banfield Freeway, requiring replacement of the viaduct. Photo courtesy of Gordon’s Fireplace Shop. Check out this image below as well, which shows our aircraft factory building in 1956 as Erickson’s Furniture. The new viaduct associated with construction of the Banfield freeway (I-84). Looking south on Northeast 33rd at Broadway. Construction of a new viaduct. Courtesy of City of Portland Archives. During our visit this weekend, we learned that the building houses the second oldest freight elevator in Portland, and it’s big. Like a two-car garage that levitates between the first and third floors. It doesn’t take much imagination to see it filled with furniture or spruce airplane parts. But pasta? Hmm. A detailed look at aerial photography of the area over the years (with thanks to Ed McClaran), confirms that the building did indeed once extend east across what is today’s parking lot, and connected up with the building that now houses Rose City Furnishings in the 3400 block of Northeast Broadway. The view from the top floor is impressive: both up and down Sullivan’s Gulch to the east and west. North across the busy intersection toward the Dolph Park neighborhood. But there are no hidden nooks or crannies with artifacts from Oregon Home Builders. 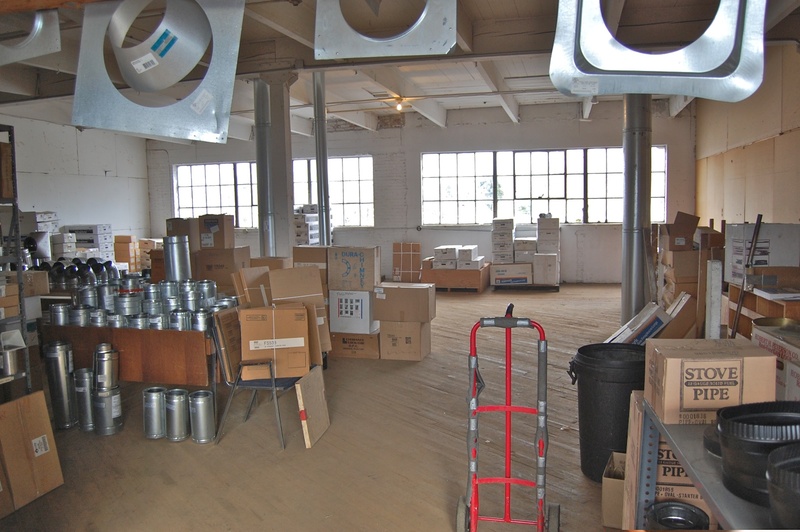 It’s a tidy and well-organized warehouse on the upper floors. Here and there you can tell from marks on the floor where heavy machines and equipment may have been anchored, or workbenches secured to the walls. No aircraft machinery to be found here. Just a warehouse for Gordon’s Fireplace Shop. But the aircraft heyday of the building has passed and it stands on the north rim of Sullivan’s Gulch as an artifact itself while the busy intersection below surges with traffic and big development plans are underway for the blocks to the west. In the midst of the shuffle and change, it’s a time traveler with stories to tell. You always come up with the most fascinating tidbits of history! Thanks for this. Thanks for pursuing this story – very interesting! My husband and I have just moved to the Alameda area and are anxious to learn more about the architecture and the history in general. Porter Scarpelli Macaroni Co. was a pasta factory nearby. Their address was 3510 NE Broadway. That would put them a couple of blocks east of 33rd. Maybe they used the 33rd and Broadway building, too. If I remember correctly, Tarlow’s Furniture occupied the building somewhere along the line. Thank you John, yes you’ve nailed it on both accounts: Tarlow’s and Scarpelli’s. The folks at Gordon’s said they think the building was once associated with Scarpellis, but the address might suggest otherwise. It’s interesting to look at the address over the door into Gordon’s: it’s still in the pre-address change format (as I recall it is 1000). The two pictures that stick out in my mind are the train coming around the snowy bend of course. Second to the train picture I was I impressed by the Mobilgas sign with the famous winged horse icon. I looked closer in the picture and read the advertisement on the bench below for Kienows, calling it the friendliest store in town. This is a slogan that New Seasons has picked up and made it their own. I remember the Porter Scarpelli building next to Tarlow’s Furniture. It was a well known brand of pasta on all the stores’ shelves. We’d drive by it in our station wagon when I was 3 or 4 years old, and my dad (a grocer) would say to me, “Do you know why that building is so long and skinny?” Then he’d answer, “Because they make spaghetti in there.” I remember picturing long conveyor belts inside moving all that spaghetti thru the building. I was sad when they razed it. But I still get to think about my dad having fun with me. In the mid 1930’s my father worked as a printer for Gullickson’s Printing which was a block or so east of Scarpelli’s. He came home one evening with a horrific story of a worker being caught in the pasta machinery. I was four or five at the time and was morbidly fascinated by such a fate and leary of even walking by the building. Great story. Had no idea that aircraft were manufactured there. I wonder if the planes were tested at the airfield that later become the Rose City Park Golf Course. That might have been the closest place for testing a plane. I own a dining table and chair set made by the Beaver State Furniture Co, Portland, Oregon, November 28, 1922, that still carries the original paper (instructions on how to use) glued to the underside of one of the hidden and bracketed tables leaves built into the table…it’s beautiful and still functions perfectly! Interesting to see where they made my table! Thank you! I love history, especially local. some updating and refurbishing but the sign that’s still on the corner of the building now is the original one. It was changed with each owner: Erickson, Tarlow and now Gordon’s. One other omission is the fact that there was a drapery manufacturing business was in the building prior to the Gordon’s purchasing it. 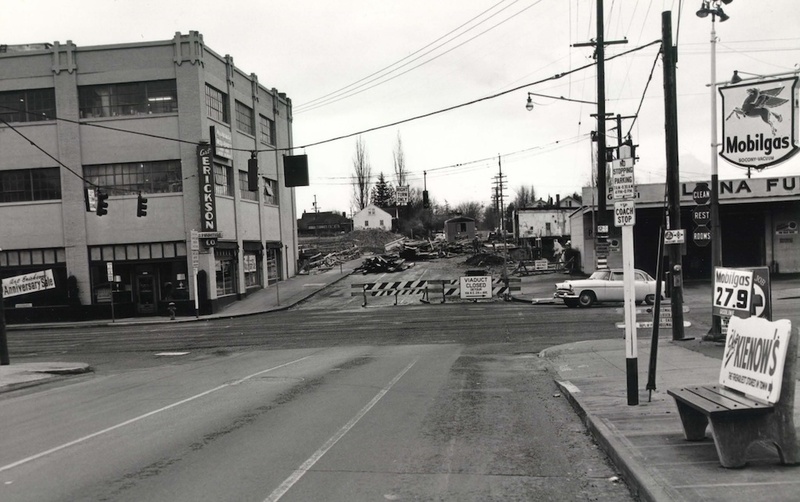 I would like to have read something about Superbilt Manufacturing Co that was in Sullivan’s Gulch only to be destroyed by the construction of the Banfield freeway. That was a business owned by the Edelson, Tarlow and Rosenfeld families. Nice, informative piece but incomplete. I own a table made by Beaver State Furniture in the 1920’s. I was happy to find this information on the furniture Company that made this beautiful piece. It is still quite lovely and has the label inside the table. It has two built in leafs that come out of the table, made of maple.